NoviFlow launched its NoviSwitch 1124 and 1248 switches featuring support for OpenFlow 1.3 and capable of achieving speeds of up to 200 Gbps. The move positions the company as an early leader in Software-Defined Networking (SDN), the network optimization technology that brings the benefits of network virtualization and programmability to large data centers, network operators, cloud and financial service providers. "The OpenFlow protocol has proven itself in real-world SDN deployments by leading companies, such as Google and Facebook. 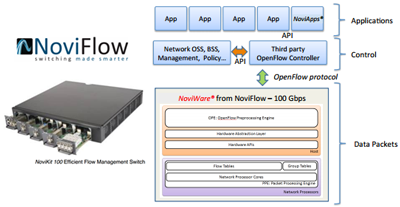 Now we’re giving OpenFlow 1.3 a high-performance boost,” said Dominique Jodoin, president and chief executive officer of NoviFlow. NoviFlow has offices in Sunnyvale, Montreal, and Seattle.